EC Miami would like to wish everyone a Happy New Year!! 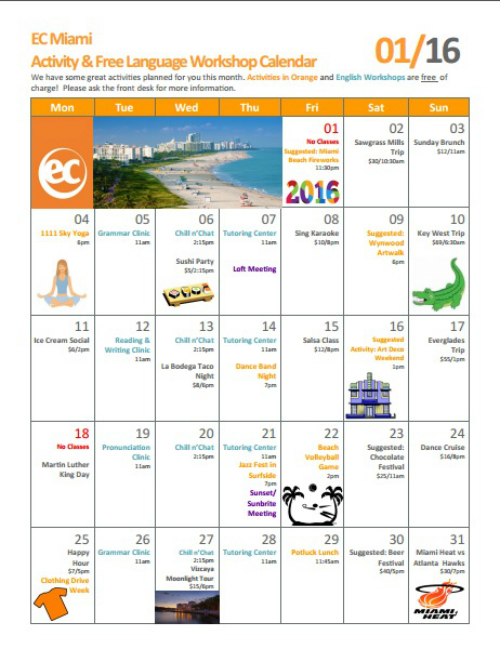 The picture above is our January 2016 Activities calendar, in which you could get the full immersion English course in Miami! Students could participate in our FREE English class to improve their understanding of the English language. In addition to that, we provide FREE activities to help students fully immerse themselves into our English courses in Miami such as Dance Band Night or 1111 Sky Yoga. We also give students the opportunity to give back to the community through our Clothing Drive Week event. If there is any activity that caught your interest, come to the front desk to sign up for a full immersion English Courses in Miami!